In the first decade of the twentieth century, Henri-Edmond Cross’s work was increasingly appreciated both by critics and patrons; ill-health slowed his output (though not his skill) and he died in May 1910. The first decade of the twentieth century, however, has been described by Françoise Baligand as Cross’s ‘plus féconde’ period: ‘Après les incertitudes des années précédentes, il pousse ses recherches à’l’extrème et, abandonnant les contraintes qu’il s’imposait, laisse épanouir son art au gré de son imagination’. Cross had settled at Saint-Clair near St Tropez in 1891 and lived there for the rest of his life. He visited Venice with his wife Irma from 7th July to 12th August 1903. Coming after a spell of painful electrical treatment for his rheumatism in Paris, Cross found Venice a delight and a revelation. He wrote in his travel journal: ‘Venise est comme la vie….Toutes les nuances, depuis la gravité assise jusqu’à la plus inepte frivolité. Et l’architecture admirable variée et vivante est comme le prolongement vers le ciel de cette vie intense, de ce maximum de vie, donnée par ces canaux aux reflets infinis’. He roamed the city with his sketchbook and watercolours, capturing quick, instinctive impressions. Françoise Baligand comments: ‘In the city of the Doges, having finally achieved full mastery of his art and the answers to his questionings, Cross….found the serenity he so direly needed’. Back in Saint-Clair, Cross immediately set to work upon a series of oil paintings of Venice. He sent six to the Salon des Indépendents and two to the Libre Esthétique exhibition in 1904. A further ten Venetian views were shown at Galerie E Druet in 1905: the present Vue du basin de Saint-Marc, Venise was probably catalogue no.23. 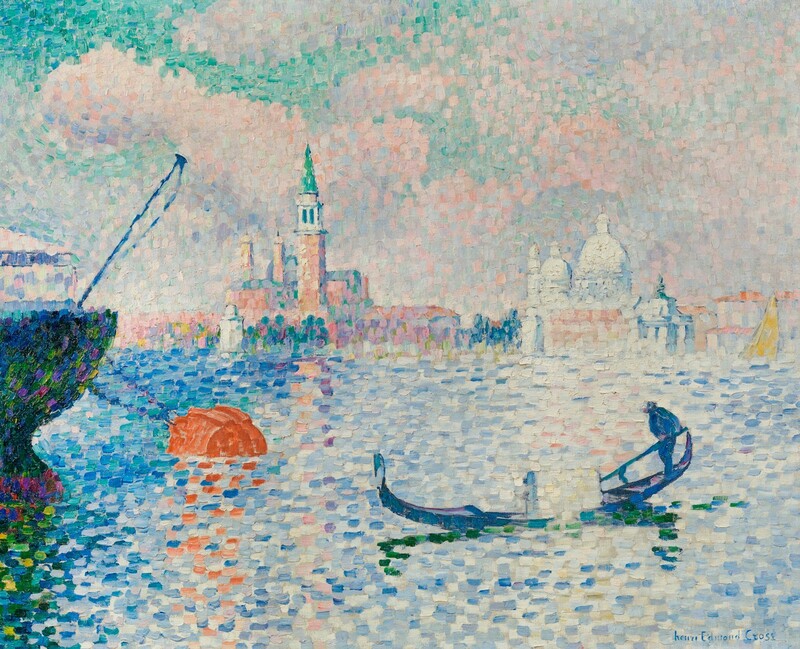 The painting shows the Punta della Dogana with the dazzling white domes of Santa Maria della Salute behind it, and on the left the campanile and monastery of San Giorgio Maggiore. Cross has narrowed the stretch of water between the Punta and the island of San Giorgio, the better to create a band of architecture between the shimmering blues of the lagoon and the cloud-flecked, blue-green vault of the sky. Cross was born Henri-Edmond Delacroix, the child of an adventurer and failed businessman, Alcide Delacroix, and the English-born Fanny Woollett. He adopted the English version of his surname in 1881 to avoid working in the shadow of his famous namesake Eugène Delacroix. Cross studied with Alphonse Colas at the Ecoles Académiques de Dessin et d’Architecture in Lille from 1878-81 and in Paris with Emile Dupont-Zipcy in the early 1880s. In 1884 Cross helped to found the Societé des Artistes Indépendants and became friends with many of the Neo-Impressionists. From the mid-1880s he lightened his palette, began to paint en plein air and concentrated on landscapes. In 1891 he showed his first Neo-Impressionist work at the Indépendants, a portrait of his future wife Mme HF (Musée d’Orsay, Paris). The same year he moved to the South of France, settling in Saint-Clair near St Tropez where he lived for the rest of his life; Signac moved there in 1892. In the early and mid-1890s Cross painted seascapes and peasant scenes. Over a densely painted ground he placed round touches in rows and mixed colours with white to express the hot light of the Midi. The sinuous silhouettes of The farm, 1898 (private collection) reflect the influence of Art Nouveau and Japanese prints. In the mid-1890s, working with Signac, Cross adopted larger, block-like strokes to create a mosaic-like surface. This ‘second’ Neo-Impressionist style inspired Matisse and the other Fauves to visit the South of France at the beginning of the twentieth century. Cross’s late seascapes introduced nymphs and fauns, mythological figures that haunted the Classical South. Politically, Cross sympathized with the Anarchists and in the 1890s contributed illustrations to Jean Grave’s Anarchist publication Temps nouveaux. Eye problems and arthritis curtailed his work in the last decade of his life, but he had important one-man shows at Galerie Druet in 1905 and Bernheim-Jeune in 1907, leading to greater recognition both by buyers and critics. Poised to reap the fruits of his success, he alas died at Saint-Clair on 16th May 1910. The work of Henri Edmond Cross is represented in the Musée d’Orsay, Paris; the Hermitage, St Petersburg; the Metropolitan Museum of Art, New York; the Art Institute of Chicago; the Kunstmuseum, Basel and the Thyssen-Bornemisza Museum, Madrid. Françoise Baligand in Douai, Musée de la Chartreuse de Douai, Henri-Edmond Cross 1856-1910, 1998-99, exh. cat. by Françoise Baligand et. al., p.42. ‘Venice is like life….In all its nuances, from secure solemnity to the most inept frivolity. And the wonderfully varied, lively architecture is like a heavenward-reaching extension of this intense life, of this maximum life given by these canals with their infinite reflections’. Quoted by Françoise Baligand in Paris, Musée Marmottan Monet, Henri-Edmond Cross et le néo-impressionisme De Seurat à Matisse, 2012, p.88. Musée Marmottan Monet, op. cit., p.88. Quoted in Douai 1998, op. cit., p.42.